We were interviewed by local English newspapers and here's the article and video. I like the headline, "When you want to swing big swords...."
Thanks for reading! That reporter is sincere and nice to us, which is refreshing. but what do you mean by "until the property prices drive me out of business" ? are the rents that high in hongkong ? or the raw materials for your training swords ? Real estate price here has surpassed Tokyo, being the ridiculous number one, top of the world, for the crappy space. Thank you for your kind words and wishes. Good interview well done and congratulations also I enjoy your sparing videos. Thanks a lot. Here are the longer version featured on South China Morning Post. I noticed that, it was a very flattering article. Read the article and it's a very good one, also nice to know a bit more about your personal life and early health issues. I assume that you are much better now or that the problems are at least under control and manageable: You do seem to move very fluidly in all your videos but I think you probably decided to not do the kind of martial arts that would involve getting hit hard or risk dislocating body parts with arthritis issues ? Well, if the rents get so high that you can't afford them maybe moving to another country might work ? Although the various immigration laws of different countries can be a labyrinth of convoluted regulations and hurdles to jump: Maybe Canada, the U.S.A. Australia, New Zealand or Great Britain might be good choices assuming you and your wife could qualify ? Obviously the above idea is just my thinking out loud and you may prefer to not comment on very personal issues. Jean, you’re too transparent in your desire to have Lancelot bring his school to Montreal! While Montreal is admirably beautiful, a far more logical location would be the upper Midwest, the Twin Cities for example. 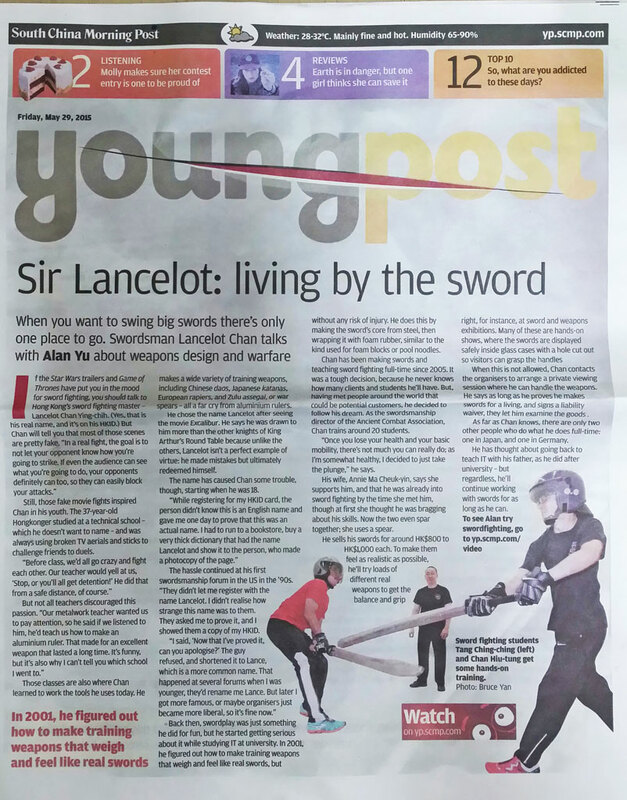 That was a very nice article Lancelot. I wish you continued good press! At first, I chose European style and then studied German style at first to avoid the rheumatoid arthritis's hindrance. It was after my recovery through Buddhism method that I can start to handle the Chinese style that I learned from 2008 to early 2015. Now I use my own style that combined everything from my previous knowledge. On the paper media, the title was sliced open even! Interesting artwork.